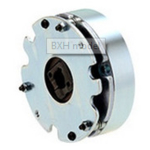 These are dry, spring-actuated brakes that are compact and dedicated for holding and emergency braking. They provide double the brake torque of BXL models of the same size. They naturally satisfy 100% of the rated torque values from the initial use, so the customer does not need to break them in.